I have been very lax in writing about this. It is excruciatingly painful to me, as it is to us all. When will those idiots running what passes for a government in India going to clean up their act? When is what passes for a police force in Punjab going to protect and defend the citizens instead of murdering and torturing them? And when are Those Fools in Amritsar going to stand up as our leaders and give us something to be proud of in them? WHEN, WHEN, WHEN? 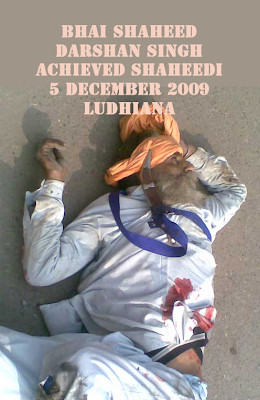 We have no idea how many have been injured and how many have achieved shaheedi in this latest round of violence. I just received this e-mail from Kaurs United. If you live anywhere near British Columbia, Canada, please attend. It's the least you can do to show your appreciation of and solidarity with our sisters and brothers in Occupied Khalistan. Vaheguru jee ka Khalsa Vaheguru jee kee Fateh!! The time has come again where Sikhs have taken the ultimate step of giving their lives in protest of Sri Guru Granth Sahib ji's disrespect and slander. You've assuredly seen videos of the recent Ludhiana Kaandh and the brutal beating, shooting, and abusing of Singhs who were protesting against Ashutosh Noormahal, the government hired self-acclaimed "Baba", who insults Gursikhs, and claims that the jot of Guru Nanak Dev Ji is in HIM, and not in Guru Granth Sahib Ji. If we conversed with Sant Jarnail Singh ji today, would Sant Ji not send another Jatha of 13+ Singhs to protect the honour of the Sikh Nation and fight the disrespect of our Gurus? Numerous Singhs have been killed by police bullets in the past few days when we were sitting in our warm homes.... What's worse is that many bodies have been taken by the police, and we are not even able to count how many have actually gotten Shaheed. Shaheed families have been offered money from the government, to remain quiet about their loved one's Shaheedi. Khalsa Jee, are we feeling Panthic Dardh, or just worried about our own hungers and desires? Why are we not thinking about our brothers who were brave enough to fight in the front line against those who disrespected our Guru? 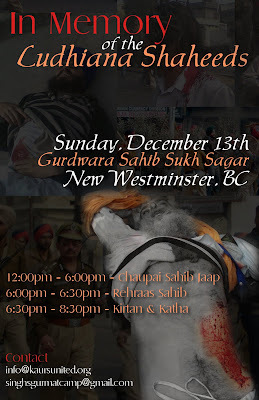 THIS SUNDAY AT SUKH SAGAR GURDWARA SAHIB .... Sikh Youth and Families from all over B.C. will gather to pray for our Shaheeds and the beautiful Singhs who are still in the hospital, barely recovering from the attacks (http://dhansikhi.com/Multimedia/VideoMain.aspx). Sangat Jee, let's not disappoint our Shaheeds and mistakenly believe or imply that our time is more valuable than their sacrifice. Whether it means calling in for compassionate leave that day or finishing your work early, please, for the sake of our SHAHEEDS, attend this event for as long as you possibly can, as times of unity may not last forever... Alas, some Gursikhs around the world are left to feel this Panthic Dardh all alone, and cry for the safety of their brothers, and for the freedom of their Nation, while we can share our pain together. Let's share our love this Sunday and prove to every Anti- Panthic Dusht that we will never be silenced. Are the Panth's SHAHEEDS worth your time? Human blood ought to be precious enough to raise revolutions from fertile lands. I wish you godspeed. Two from you in one day! I do feel blessed! Our shaheeds are our most beautiful flowers, plucked to adorn the heavenly abode and merge into oneness with our Creator. They are at peace. I plan to write a post about this as soon as I get all the details. When it is the Hukam of Vaheguru (Will of God) everything will fall into place and we will reap the great and good crops growing from the blood of our shaheeds, every drop precious. I admit I must work very hard on the virtue of patience! Thank you for subscribing. Your continued support gives me strength. This whloe thing is shrouded in mystery. I've been unable to make heads or tails of what's happened or why. I heard there was a peaceful protest, but havn't figured out why anyone was protesting. The videos I saw looked anything but peaceful. Sikhs also need to take lessons from our Gurus. When Teg Bahadur Became Guru he kept quiet while 22 imposters tried to fill his roll.